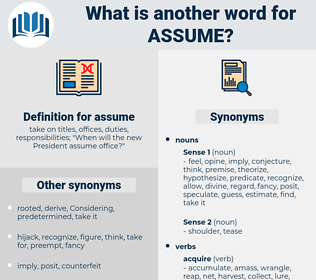 What is another word for assume? take on titles, offices, duties, responsibilities; " When will the new President assume office?" presume, Told, suggest, imagine, presuppose, accept, bear, believe, guess, expect, speculate, imply, perform, thinking, thought, consider, think, play, suspect, incur, anticipate, carry, exercise, foresaw, involve, daresay, postulate, envisage, acknowledge, feel, understand, infer, estimate, pose, admit, fulfill, foresee, represent, approve, exert. presume, shoulder, taking, takes, suggest, imagine, presuppose, accept, bear, believe, guess, expect, speculate, imply, embrace, perform, assert, discharge, consider, think, play, suspect, absorb, incur, anticipate, Occupying, resume, acquire, carry, exercise, pretend, estimates, held, holds, deduct, involve, sustain, incorporate, afford, underwrite, implement, postulate, accomplish, boast, fill, assure, envisage, acknowledge, feel, uphold, seize, understand, infer, estimate, pose, tolerate, address, cope, endure, withstand, admit, fulfill, foresee, represent, entrust, approve, assign, defray, exert. calculate, ignore, not believe, abstain, let alone, neglect, discard, not do, disbelieve, reject, know, misunderstand, prove, disregard, leave, not take, doubt, forget. oppose, differ, be original, tell truth, be honest, reverse. conclude, complete, give, offer, finish, end. deny, decline, confute, find out, furlough, ax, take back, belie, bypass, withdraw, discount, disagree, abandon, fire, discharge, disown, refuse, lock out, unsay, detour, refrain, recant, surrender, back down, challenge, turn down, forsake, dispute, distrust, lay off, forbear, disclaim, document, back off, learn, sack, disprove, backtrack, validate, can, give up, abjure, discredit, spurn, retract, repudiate, rebut, dismiss, refute, wonder, ascertain, avoid, disavow, controvert, determine, mistrust, question. Whether he will be able to assume an easier and a lighter manner, I do not know. agama, awesome, as was common, ascoma, acne, agene, agism, assouan, aachen, augean, aghan, asana, akin, awaken, assignee, azymia, Aken, acheson, acme, agamemnon, aecium, Asama, assam, accession, ashen, again, asian, ash can, ashcan, asean, agni, asimina, ask in, A. E. Housman, away game, acousma, asin, assign, agony, achaian, auxin, Agon, assuan, asinine, axon, Ack-ack Gun, aiken, Agnomen, agone, aegina, aigina, achomawi, axiom, aegean, axone, achene, akan, achaean, Assassin, asamiya, acumen, aswan, ageism. face the music, carry the can.